Poor pest control practice has a negative effect on wildlife. CRRU Ireland strives to raise awareness of the unintended effects of failure to abide by the recommended instructions for use printed on rodenticide product labels. CRRU Ireland promotes the responsible use of rodenticides in situations where their use is justified. To facilitate correct usage of rodenticides thereby minimising the exposure of wildlife, CRRU Ireland prepared the Best Practice Requirements for Rodent Control and Safe Use of Rodenticides, which were published in March 2016. 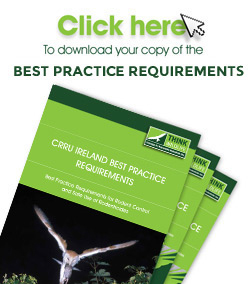 The CRRU Ireland Best Practice Requirements form an essential handbook for rodent pest management technicians and Quality Assurance auditors and inspectors in the country. The document provides key information and an important resource for the formal training of future rodent pest management technicians in the responsible and sustainable use of rodenticide products. As rodenticide products are authorized following the EU approval of their active substances, compliance with the Best Practice Requirements will be required for the mitigation of the risks for human health and the environment associated with their use. Risk mitigation measures and practices required for the authorization of rodenticide products, will be specified on product labels. Accordingly, compliance with the Best Practice Requirements, will be an essential requirement for the use of authorised rodenticide products.